WH-751 single spindle semi-automatic benchtop coil winding machine, an entry-level stand-alone solution for hot air bonded coils. 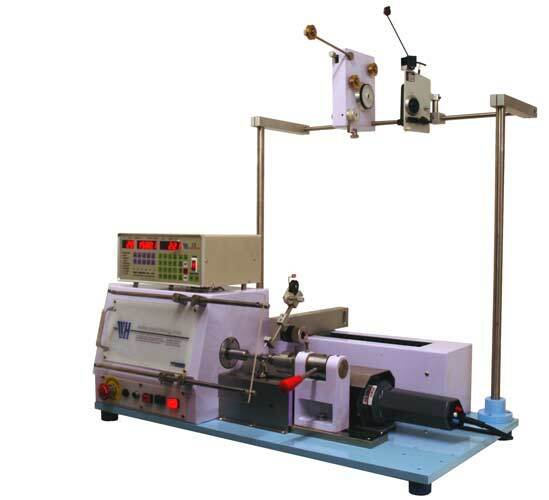 This special version of the WH-751 single spindle benchtop coil winding machine with digital control is a customised solution for winding hot air bonded bobbinless coils - "air coils". Digitally controlled for semi-automatic operation, the winding machine provides component manufacturers with a low-cost entry path into the lucrative air coil market. The machine also offers a solution in cases where the volume requirement of the product does not justify the cost of a fully automatic air coil winding machine. This stand-alone system is provided with a built-in hot air source, eliminating the need for a compressed air supply as required by most air coil winding machines. The package includes a WH-751 bobbin winding machine with tailstock and tensioner stand, wire tensioner and wire guide head as appropriate to each application, safety heat-shield, hot air gun and tooling. Precise control of the heat-gun air temperature and flow rate, and exact positioning of the nozzle heat the wire and the tooling to ensure adhesion of wire, with correct release of the finished air coil from the tooling. Careful design of the tooling, together with the advanced machine controller, provides reliable wire entry and exit from the coil every time. For the cost of the tooling – refundable against machine order - we can wind samples to demonstrate quality and establish machine cycle time for your particular air core product. As these machines are custom made, please speak to us about the specification of the air coil you wish to produce.